Captivating and intriguing, this new drama challenges audiences to consider the value of lives built and nurtured, and if they are worth shaking up. Would you risk the perfect life for an unknown fantasy? While most of us wouldn’t leave our stability or fortune to chance, the main character in John Jiler’s Half Moon Bay, Richie (Ben Gougeon), an established New York architect, is struggling with a decision that may change his life. Will his desire to do good destroy everything that he has worked for? On the night of his engagement to Pam (Jean Goto), a striking, smart and sassy woman, Richie meets timid waitress, Alicia (Ivette Dumeng), who slowly but steadily becomes the object of his obsession. Something about her innocence and mysterious nature draws him in, little by little, and his curiosity leads him to make the ultimate personal sacrifice. It is clear that something is a bit off with Alicia, as she doesn’t fully answer any of his questions or seem to remember simple details, but as the plot develops, hooks the audience and challenges them to fill in the blanks. The dapper and charming Brennan Taylor plays Richie’s best friend Tom and is the slap back to reality in this drama as he sees what’s transpiring with his friend and acts as narrator. His humor and suave style are reminiscent of James Bond as he plays both sides of the fence but has the audience wondering if he’s out to fulfill his own needs – such as having Richie’s stunning and pregnant wife fall into his arms as her marriage to Richie crumbles. 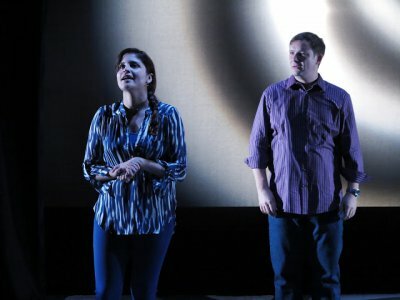 Under Margarett Perry’s careful direction, Half Moon Bay, challenges an audience to try and decipher Richie’s infatuation with Alicia and what type of relationship he wants with her. Her mysterious ways question if she even wants his help at all or if his obsession clouds his otherwise logical judgment. Dumeng is the perfect mix of purity and puzzlement when she doesn’t even recall where she grew up or who her family is. The only concern she has is her baby who was taken away from her as she worked hard at part-time job after part-time job to make ends meet. The audience is left to ponder what her motives are and if there is any rationale to Richie’s decision to invest in her life. The do-gooder in him is admirable but the price he pays to help this woman is heartbreaking, causing the audience to feel sympathy as well as concern for his condition. Costume design by Debbi Hobson is on point as the bohemian and exuberant Pam is decked out in earthy colors such as browns and loose fabrics to reflect her creativity. Tom’s swagger is reflected in his tailored suits and Richie and Alicia’s attire are representative of their professions. The lighting by Wilburn Bonnell makes you feel like you were out on the quiet streets at night gazing up at the illuminating moon. This drama leaves audiences actively thinking throughout the entire production about why we are driven to make the choices we do and what causes something to snap inside of us. 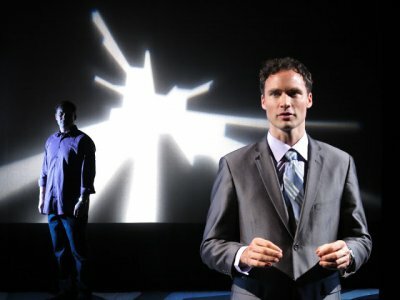 Captivating and intriguing, Half Moon Bay brings Ibsen’s The Master Builder to the present day, challenging audiences to consider the value of lives built and nurtured, and if they are worth shaking up. The old religion con artists yarn is imaginatively updated to the Internet age in this absorbing drama that’s intensely performed and creatively presented.